IDBI Direct Franchise is a one of the largest broking franchise bank in the country based out of Mumbai. 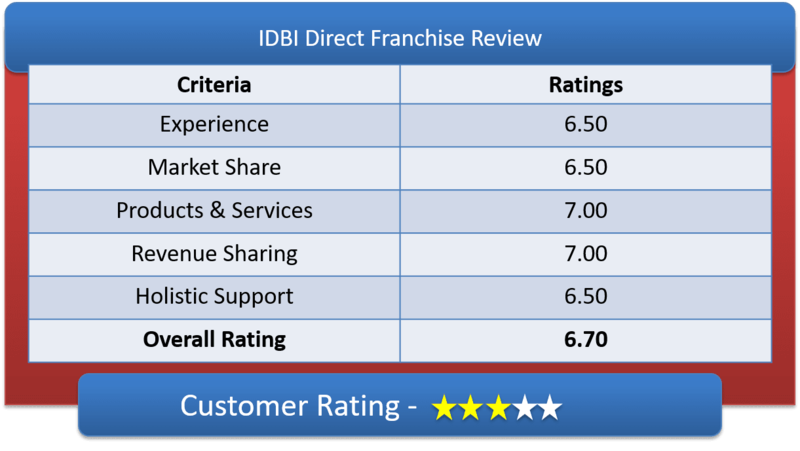 Lets have an in-depth discussion on IDBI Direct Franchise Review & deep understanding of IDBI Direct Sub Broker offerings, IDBI Direct Franchise Revenue Sharing Models & other features of IDBI Direct Partner Program. IDBI Direct is completely owned by IDBI Bank Limited; it was first incorporated in 1993. Now it is spread across India in 24 cities. IDBI Direct is a registered member of NSE, BSE, MCX-SX, MCX. It is also registered under SEBI. This company is involved Retail broking and distribution of IDBI provides all the important tools, guidance and advice to help their customers taking better investment decisions and maximizing the ROI. It provides number of services like Institutional & Retail and Research Services, Corporate Advisory Services and many more. Lets have a detailed understanding of IDBI Direct Franchise Revenue Sharing Model & their Initial investment requirements. A deposit of of Rs.300000/- will get revenue sharing slot of 75:25 ratio. For becoming a Online Remisier, deposit only Rs. 5000/- (five thouasnd only) to become and play with 50:50 share. With as little as Rs.50,000/- as deposited amount, the partner gets a revenue sharing of 60:40 percent. This is a peculiar situation that the revenue sharing is based on the deposit and not on the revenue generated through brokerage. Never the less, it is always wise to get associated with reputed name who had been through tough times. This amount is refundable during the exit of IDBI Franchise. Based on the brokerage generated, client base and good social circle, the partner will get access to all six segment to trade into with IDBI Direct. Typically, to have a share of 70:30, once needs to deposit an INITIAL investment of Rs.100,000/- (ONE LAKH only). The extra expenses of running the office and internet as well are self-bearable. The partner needs to pay the registration charge of Rs. 2360/- (non-refundable) for each segment They are reluctant to share DP revenue and the demat related revenue. They train the partners and their employees very well for fast execution of order. Online cash management. After registered with IDBI Direct they will offer training on their trading platform which will be free of cost. Although the partner need to have his own personal computer/ laptop. They do provide with advertisement material and full back office support. IDBI Franchise also provides Research report free of cost. They also provide other marketing & branding collaterals like poster, banner, Vcard, brochures, etc. Advisory to the client and training to the partner employees whichis free. Their trading application is developed by one of the finest. The trade execution is quick and easy via this android application. They charge you Rs 1000 for all the terminal. IDBI Direct offers the following services – Distribution of Financial Products, Portfolio Management Services, Investment Banking, Private Equity, Stock Broking – Institutional & Retail and Research Services, Corporate Advisory Services, Project Appraisals, Debt Syndication and Funding, Mergers & Acquisitions, etc. It also offers all kinds of trading platform like – Web/Portal based Trading, EXE Based, Mobile App and Trade Over Phone. Why Partner with IDBI Direct? How to become partner with IDBI Securities? For Franchisee registration, visit any nearest chartered accountant for proper guidance and to avoid unnecessary errors related to the registration process. Once the addendum is signed and registration is completed, the franchise code will be generated within 15 working days.